Whether you’re working on a vehicle or building something with some hefty requirements, a torque wrench can certainly come in handy. Torque wrenches give you the security that you’re doing the right things in terms of nuts and bolts. But which torque wrench is the best? What information and details even determine the quality of a good torque wrench? If you’re new to the world of tools or you’re just exploring another option, take a look at the following guide for some basic information about torque wrenches and why they’re helpful. Later, we’ll talk about some of our favorite products. A torque wrench is a handy tool that lets you apply a specific amount of torque, or linear force, to a fastener. This force is related to the amount of push, pull, or twist on an object. A torque wrench lets you set a necessary level of tightness in screws, bolts, nuts, etc. While it can be difficult to know exactly how tight you’re screwing a fastener in with, say, a screwdriver, a torque wrench allows you to set the exact level you need before doing the deed. Certain features on the torque wrench—whether it be a clicking sound or an electronic setting—will let you know when you’ve properly fastened your equipment. An inexperienced handyman or someone just getting started may figure that you should also tighten a fasten as much as possible for the most secure closure. While that’s true in some cases, other times, it can be a disaster. Torque is most often important in terms of vehicle construction and repairs. The amount of torque you use can make or break the vehicle in terms of safety. For example, if a nut or bolt is too loose, it can cause the wheel to fall off of a moving car—which, of course, is very dangerous. If you tighten the bolts too much, you risk doing damage to the parts that you’re securing together, which also poses a threat. When you use a torque wrench and set your desired torque, you avoid these safety risks and maintain the perfect tightness. To make things a little more complicated for you do it yourself-ers, there is more than one type of torque wrench. In fact, today we’re going to talk about five different types of torque wrenches. Let’s dive in and make these explanations as simple as possible. In this day and age, it’s not surprising to see that a classic tool now has an electronic version. This type of torque wrench is super easy to use because it’s programmable in terms of setting limits for torque levels. The electronic design sends a signal to determine the force of torque per unit. This information gets displayed on a fancy LED screen for your convenience, letting you get the perfect torque every time. 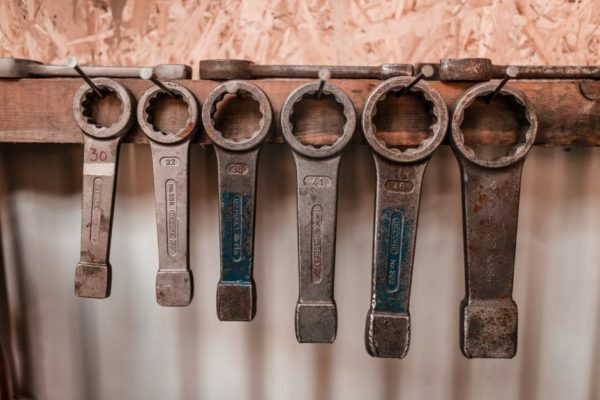 These wrenches are great for professional projects where records are necessary because your readings can be accessed on computers for spreadsheets and documents. The most basic type of torque wrench is a beam wrench. This wrench is usually the cheapest of the bunch, too, given its simple design. Beam wrenches work using a lever arm. 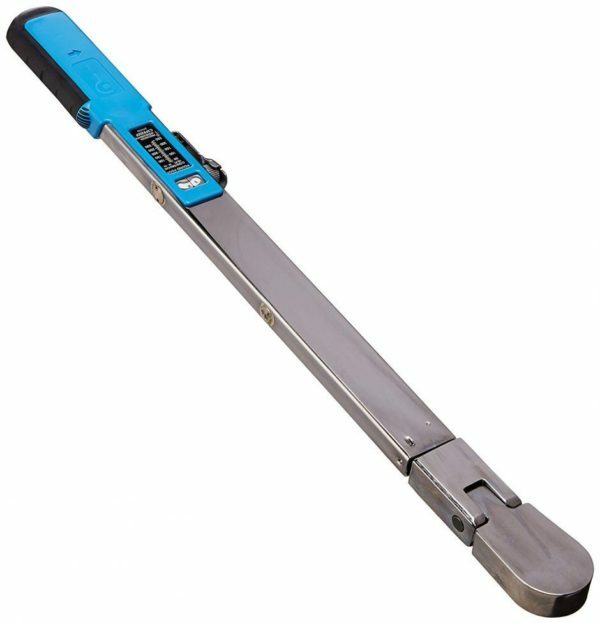 The lever arm offers elasticity that allows the wrench to bend just slightly when you’ve reached the point of pressure. A small indicator sits parallel to the arm while stationary, and when in use, it will move on a scale to give a reading. This scale is similar to a non-electric bathroom scale that spins when you step on it. Simple and straight to the point. A click wrench is very similar to a socket wrench. Using a type of clutch mechanism, users can preset the level of torque needed for a job. Without going through the specific mechanics of the tool, a click wrench will basically stop itself from over-tightening something. An audible “click” sounds when you’ve reached the point of torque as well. Hydraulic wrenches have the advantage of reaching torque levels the fastest. These wrenches are industrial strength and are typically used on large bolt heads in things like industrial pipework and large industrial structures. So, the chance you’re going to buy one of these babies is very slim. However, it doesn’t hurt to recognize the difference. Hydraulic torque wrenches are hooked up to a hose and a power pack and include impact sockets with superior strength. Using a pressure regulator and a little bit of setup, these wrenches automatically tighten and stop when the right torque is reached. 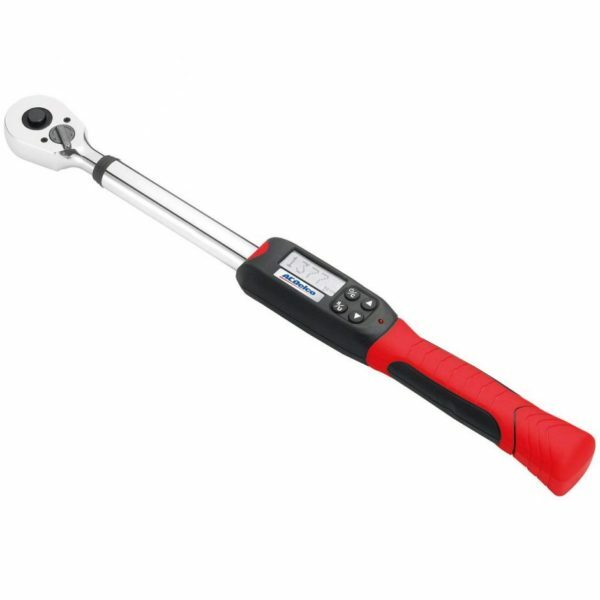 Also called a dual-signal torque wrench, this wrench uses—appropriately—a dual-signal trip mechanism to read torque. Basically, the torque is applied to deflecting means instead of standard coil springs. This design elongates the life of your tool, gives more accurate readings, and provides both audio and visual signs that you’ve reached your torque goals. One of the most important things about a torque wrench is its accuracy. A wrench might look good and have all the right features, but if it isn’t accurate, it won’t do you much good. Most standard torque wrenches have a claim of +/- 4% accuracy. This means the reading you get will be accurate either 4% above your target or 4% below your target. While many torque wrenches will claim to have this level of accuracy, it doesn’t necessarily mean that they will. Be careful to review a company’s guarantee policy and return procedures in case you get a dud. Also, keep in mind that some wrenches take a few uses to work their way up to their claimed accuracy points. Think of it like breaking them in. They may not be perfect at first, but give them a chance to live up to the standards. 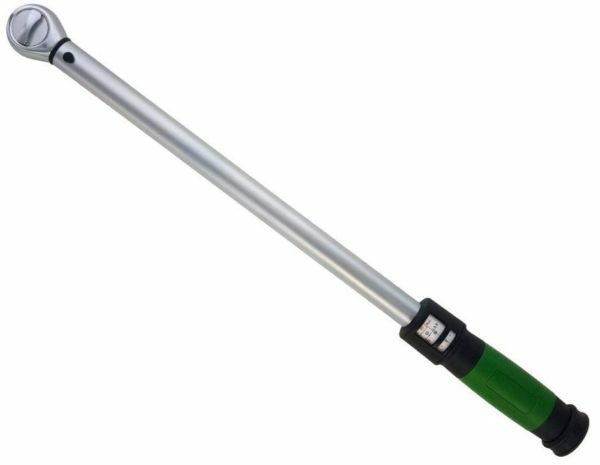 It’s very likely that the kind of torque wrench you’ll be using, or purchasing, is a beam wrench, a click wrench, or an electronic (digital) wrench. Those are the most common types, but you never know what you’ll run into on a construction site or in a workshop! Regardless, we’ve put together a list of our favorite torque wrenches. Follow along to read some helpful reviews along with the ups and downs of all our choices. 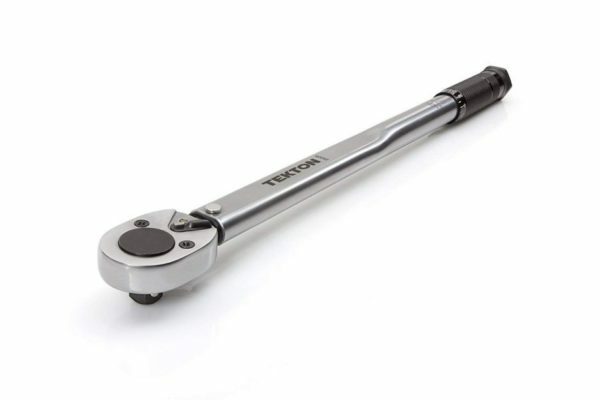 Made with a simple, easy-to-use design, the Tekton Drive Click Torque Wrench uses standard click technology to give you an audible sign that you’ve reached your desired torque levels. With a built-in handle scale, you can easily read the contrasted numbering as you work. The all-steel construction makes this tool incredibly durable and able to handle your toughest jobs with little to no wear and tear. 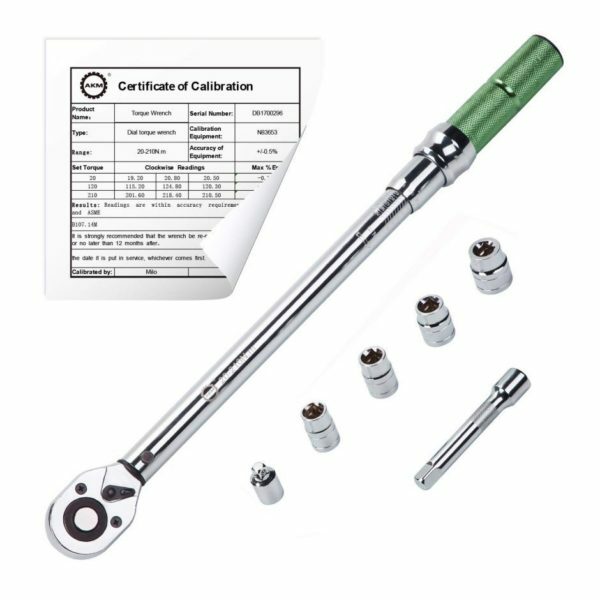 Additionally, you can use this torque wrench both clockwise and counterclockwise, measuring torque in both directions with a reversible ratchet head. Measure from 10 to 150 pounds-feet with this one tool. This tool even comes in a protective carrying case for safe storage and transportation. Simple and reliable, you can’t go wrong here. We live in a digital world, so a digital torque wrench might just be a good solution. The ACDelco Digital Torque Wrench comes in three sizes: 1/2 inch and 3/8 inch. It supports torque from 4 to 99 pounds-feet with an LED display screen for easy setting and reading. This high-tech tool makes sure that you stop at the right torque level by not only buzzing but flashing lights, too. The manufacturers guarantee +/- 3% accuracy range and quality standards. To top it all off, this digital torque wrench has a comfort grip handle that is slip-resistant for sturdy and reliable use. Other features include a quick release, a reversible ratchet, and battery operation. It’s also extremely lightweight compared to its competitors. With an excellent, ergonomic grip, this torque wrench was made to be held and used comfortably. The Precision Instruments Drive Split Beam Torque Wrench displays an easy to read scale that operates as you use the tool. Because it’s not digital and there are no batteries, turning it on, or remembering to turn it off. The torque settings on this wrench lock so you can set it once and use it multiple times without resetting. This option is very convenient for activities like tightening bolts on a wheel. Because this wrench has an adjustment knob, it eliminates spring tension. This means your projects will go quicker and easier. The nickel and chrome finish is a nice touch to give this tool a classy look as well. This classic click torque wrench is not only a beauty, but it handles well and gets the job done. The clear readings on the handle are easy to see and use. With a locking feature on the bottom, you can avoid accidental changes and keep your torque setting where you need it to be. The eTORK wrench makes a clicking sound when you reach your torque level, but it also automatically releases at the same time. It is guaranteed to be accurate +/- 3% in a clockwise direction, which is better than a lot of its competitors. The comfort handle gives you such an excellent grip that it actually takes less effort to adjust torque. Measure both clockwise and counterclockwise torque with this reversible tool to use it for any project. If versatility is what gets you excited about a product, then get excited, because the AKM Drive Dual-Direction Clock Torque Wrench comes with all the pieces you need to get any job done. With a 20 to 160 foot range and five different sized bits, you can do all of your low to medium torque projects. In addition to the different bits, this wrench also includes a half-inch lengthening bar that extends your wrench’s ratchet head. Made from chromium vanadium steel alloy, this durable head won’t let you down. Using laser technology, the manufacturers made sure that you can easily read the calibration. It’s also very simple to set your torque levels, and with a +/- 3% guarantee, you’ll never have to worry about accuracy. The locking ring lets you lock your calibration into place in both clockwise and counterclockwise position. The anti-slip handle makes one-handed use easy and keeps you confident. Finally, when you’ve reached your torque target, you’ll hear a click sound. While there are certainly tons of awesome torque wrenches out there, the above mentioned being just a handful of them, the choice was clear to us as to which was our favorite. After testing each of them and reviewing their features and downfalls, we just had to go with the AKM Drive Dual-Direction Click Torque Wrench. This wrench is made to be sleek and eye-catching with its green handle and smooth surface. The non-slip grip makes it super easy to use and very reliable, while the double ratchet head lets you switch from clockwise to counterclockwise in a breeze. We also love that this tool comes with different sized bits—a feature that none of its competitors in this article included. The lengthening arm was also a pretty cool add-on that caught our attention. Not only does this wrench look good and comes with excellent add-ons, but it functions great. We have no complaints when it comes to this wrench in terms of quality or productivity. It’s easy to use, easy to read, and easy to set. The locking function also makes sure you never lose your settings. It’s clear to see why we love this wrench, but now the decision is up to you. You can take a closer look at the wrenches we’ve reviewed today, but know that you have a little more knowledge and experience under your belt, you can try to find your own perfect torque wrench to suit your needs and your style.